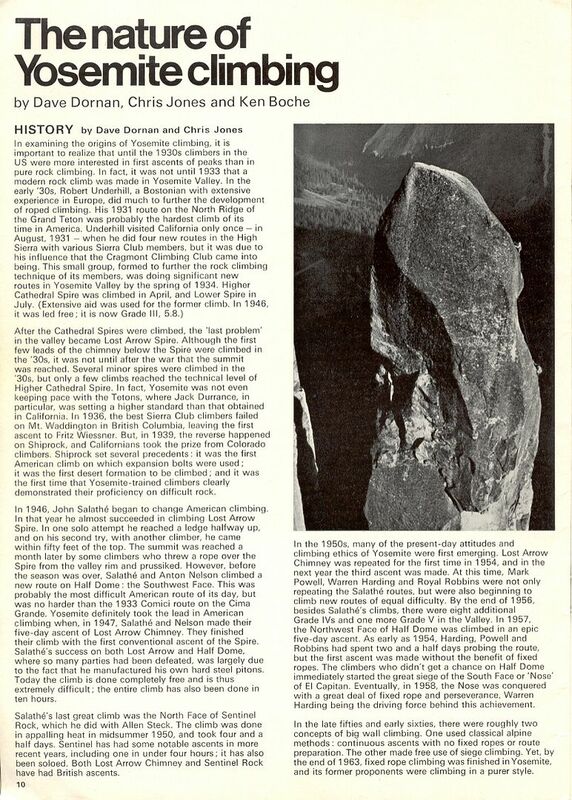 This is one of my favorite articles from the 60s; the 15th and first British ascent of the Nose on El Cap, in July 1968. 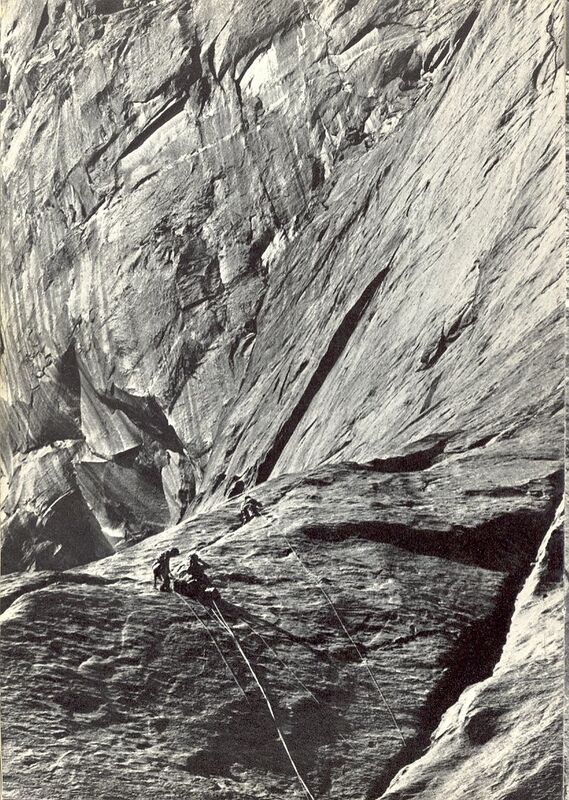 Rob Wood and Mick Burke were part of the initial migration from the British Isles that hit the climbing scene in North America during that era. Most of the “lads” emigrated to British Columbia, settling anywhere from the BC Coast to Calgary. 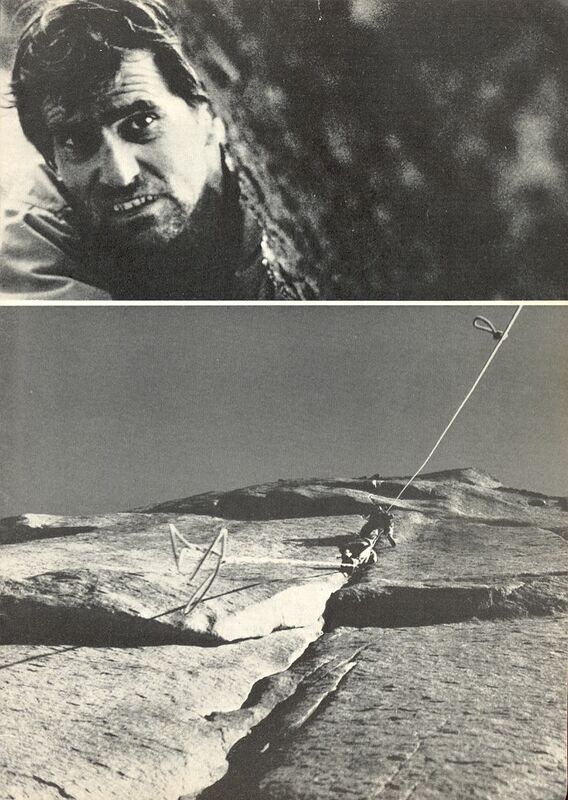 Rob Wood, Brian Greenwood, Ray Gillis, Stevie Smith, Bugs McKeith and a host of others were to forever change the climbing scene. With their love of music, drinking and bold climbing endeavors, things got to be more fun and certainly more interesting. Occasional visits from Doug Scott, Dougal Haston and Don Whillans contributed to the British influence on style and technique. Rob lives on Maurelle Island on the coast of BC. With his wife Laurie and quick access by the family “car”(sailboat) to Butte, Knight and other deep fiords that penetrate the coastal range, they have spent years exploring and pioneering new routes in this beautiful area. He has written a wonderful book, “Towards the Unknown Mountains”about a lifetime of climbing in Britian, Yosemite, Canada, and Baffin Island. 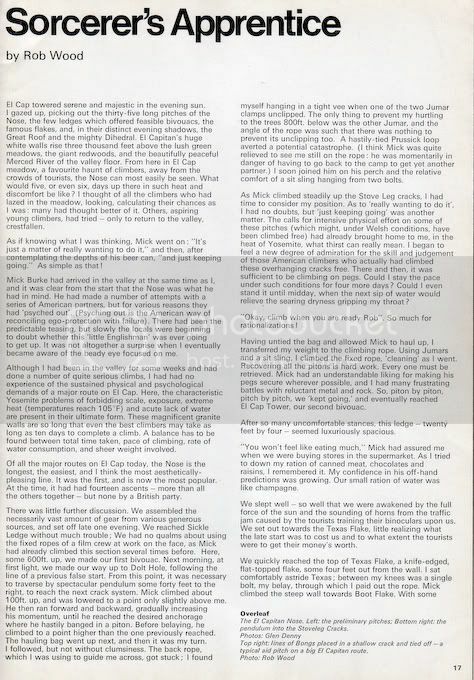 Mick Burke tragically disappeared near the South Summit of Everest in 1975 as a member of the South West Face expedition. This must have been thought a fairly significant climb at the time, although I believe that a French (?) party was the first foreign team to climb the Nose. 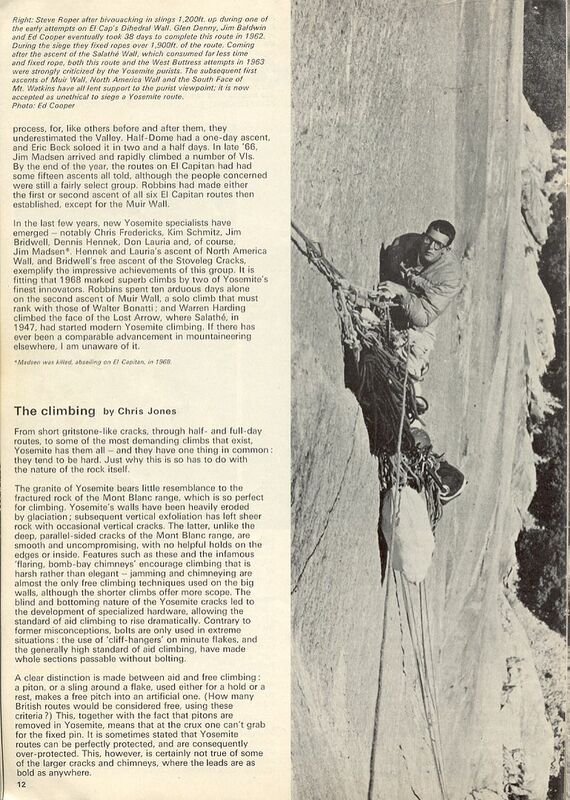 And of course Jim Baldwin was the first 'foreigner' to climb El Cap. 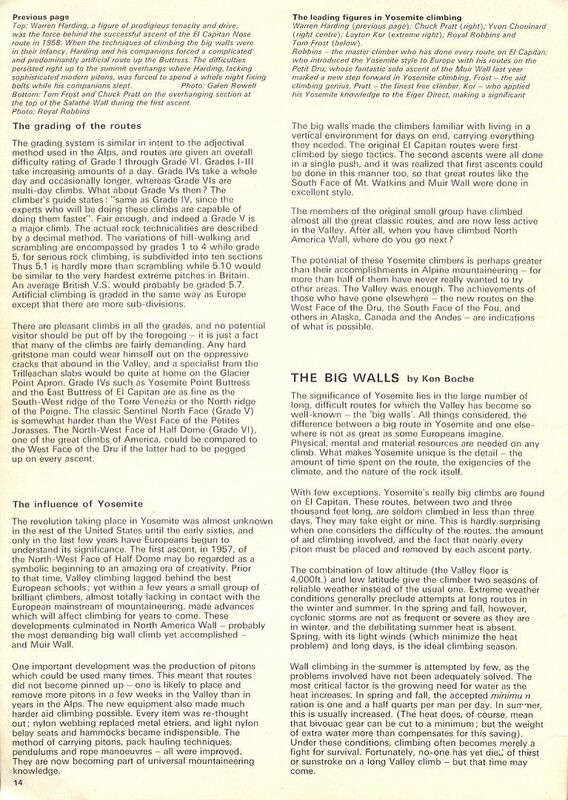 The Brits who visited the Valley in the 1960s - Whillans, Haston, Burke and then Scott - all wrote of their trips. It would be interesting to hear what the locals thought of their visitors. 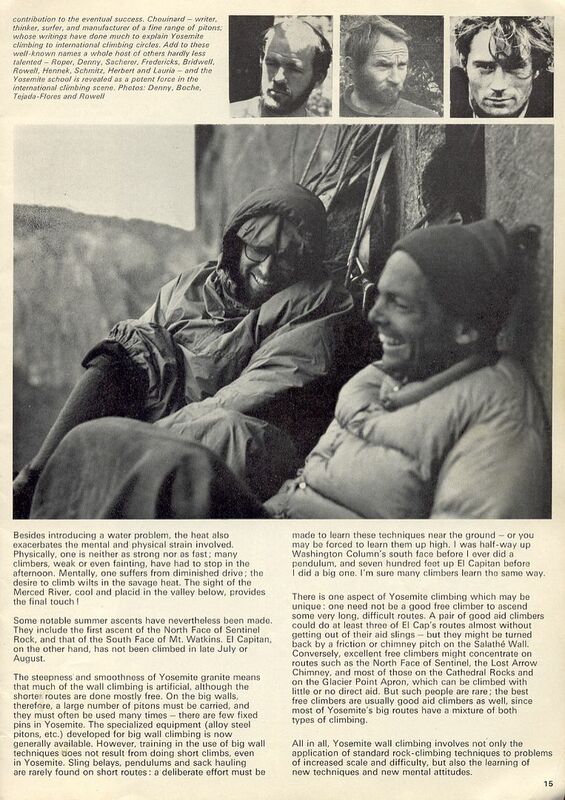 Mick Burke was on the south face of Annapurna trip in 1970, and was climbing partner of Tom Frost, aka father of Yo. 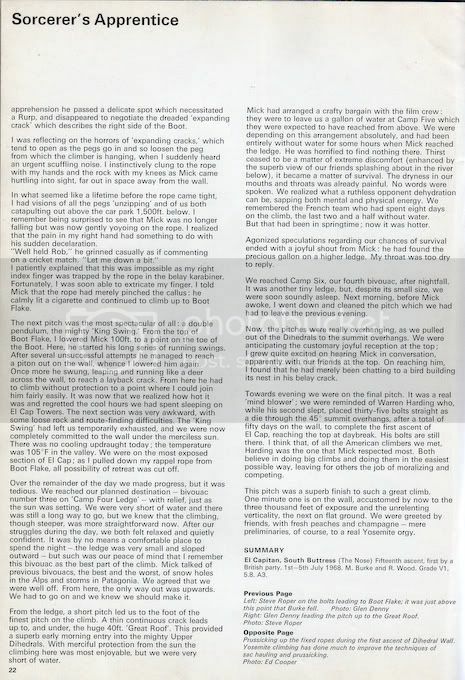 Another on that trip was Nick Estcourt, who was in the Valley in autumn 1976. He did a fair number of climbs with Richard Harrison, if I remember rightly - the Brits were camped across from the Canadians that year, and we did some climbing together. Anyway, Richard and Nick did the Lost Arrow Chimney, the Steck-Salathe, and other classics, plus Nick and Blob Wyvill did the Salathe after Blob and I were defeated. During his three weeks there, it was Nick's birthday one day. He was then in his mid-30s (ancient! ), with thinning hair, a salt and pepper beard, and mountaineer's weathering. When he went to the store for food and beer that day, someone had the bright idea of getting ahead of him in the lineup, and tipping off the (cute) cashier. Who then made a fuss about insisting on seeing his ID. "Sir, may I see your ID please. You must be 21 in California to buy beer." Made Nick's day. Sadly, Nick died in an avalanche on K2 two years later. 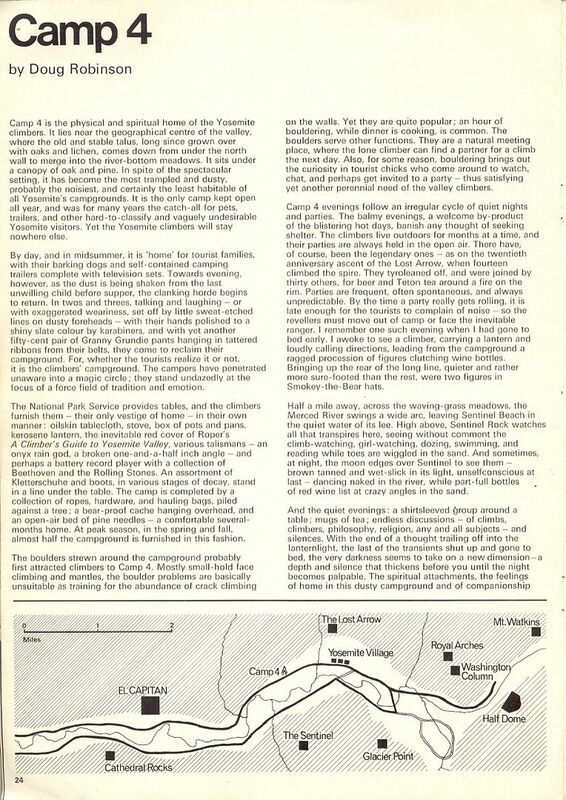 "Three shillings and nine pence" Mountain Magazine! Richard Harison and I grew up together in Upland, California and he was my first climbing partner, along with Rick Acomazzo, also from Upland. We knew all about Nic Escourt's epic climbs so when we first met him in Camp 4 we were super impressed he was actually there. Nic and Richard were natural partners and they climbed a ton of great stuff together, including El Cap and other walls. Richard was one of the first Stonemasters to begin the tradition of always climbing with the best of the visiting climbers, something we all did all the time. 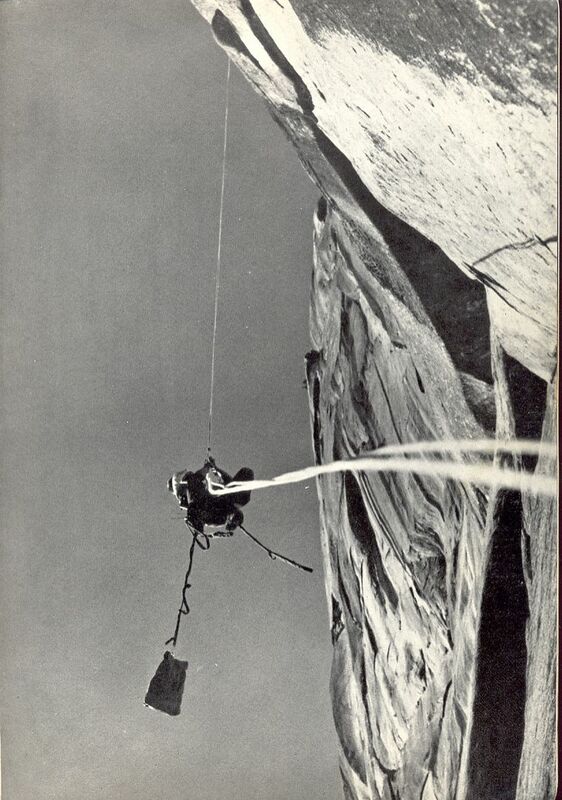 My first time up El Cap in '73 was with British ace, Ron Fawcett. Nick was one of the really grat guys to ever visit the Valley, and he will always be remembered warmly. Yes, the French team did the 7th ascent of the Nose just prior to Ken Boche and me in March 1967. 5- 1966 Williams, & ? Anybody want to update this? Don - I would love to see that list if you can dig it up. 1- 1958 Harding, Merry, & Whitmore, 45 days over a year and a half. 3- 1963 Roper, Kor, Denny, three and a quarter days. 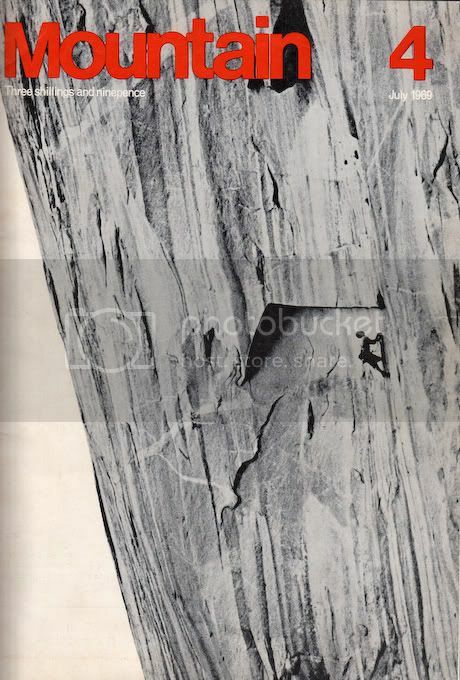 "... two French alpinists Jacques Dupont and Andre Gaunt, made the first foreign ascent of the 3,000-foot South Buttress of El Capitan. Both are guides in Chamanoix, and both were ski instructors as Yosemite's Badger Pass last winter. ... 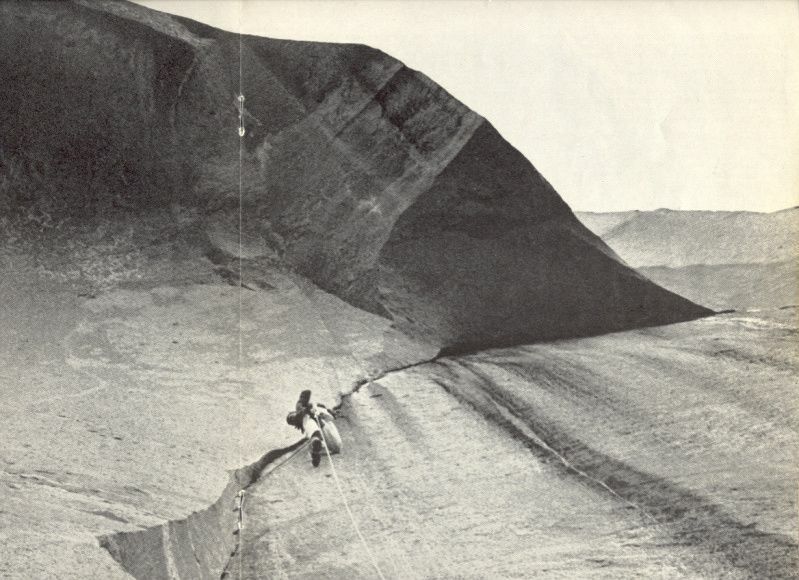 This was the sixth ascent, and after six days of thirsty climbing (they had lost part of their water on the first day), they reached the summit on April 30, 1966"
"This route was also climbed by two American parties this spring. One was composed of Galen Rowell of California and Tom Fender of Colorado. Dave Dornan, of Colorado, and two New Yorkers, Richard Williams and A. Leemets, made up the other party." 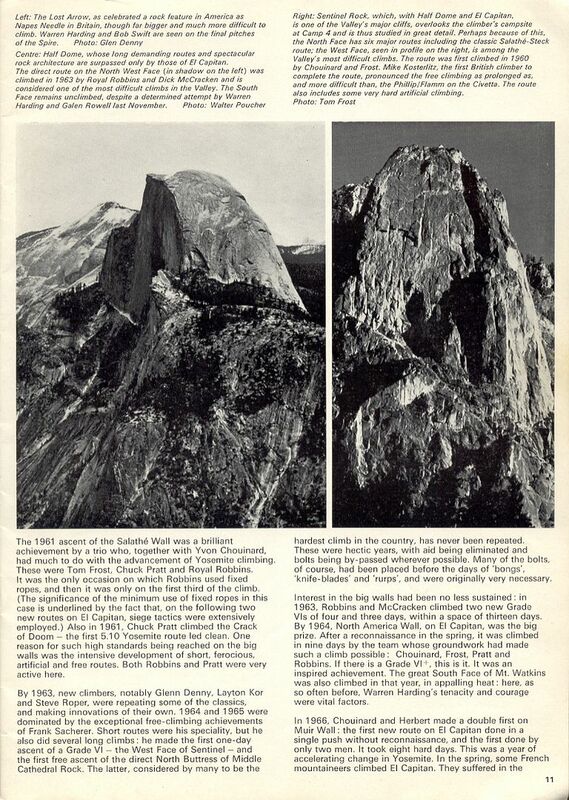 The article also adds that Steve Roper and Jeff Foote made the first one-day ascent of Half Dome. Bump for Guido, my favorite old/new taco slinger. One of the greatest things about hanging out in Yosemite was the number of international climbers we always met. I climbed with people from many different countries because of the magnet called Yosemite. It helped me shape my world view by learning from these people and realizing that they almost always knew more about the states than we knew about their country. It was always important and fun to show them that many of us in the states were not as narrow or ignorant as they thought Americans were. Truly one of the great joys of my life. Edit: The letter linked is a crack up. 3-	1963 Steve Roper, Layton Kor, & Glen Denny, three and a quarter days. 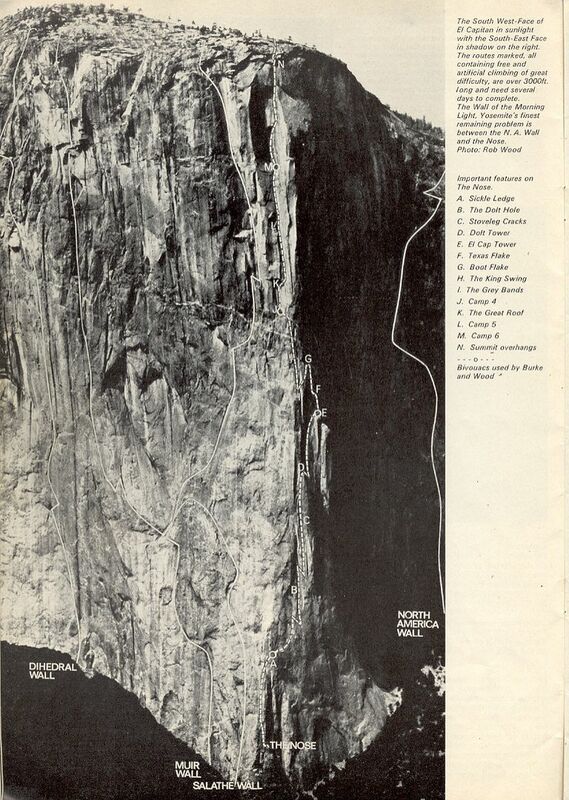 In his summary of Oct., ’68, Robbins also summarizes the other ascents of other routes on El Cap. More later, I’m sure. Bugs McKeith was also a wonderful musician and he brought may good songs to the C4 scene, the most memorable to me, because it seemed to resonate with the climbing lifestyle, was "The Wild Rover." Such a custom as yours I could have any day." And the words that I spoke sure were only in jest." Bump for a great historical CLIMBING post!!!! Right here for a bump! Great post! I'm not positive but I think the Bridwell Stanton ascent #15 may have been the FFA of the stove legs something that paved the way for the future. 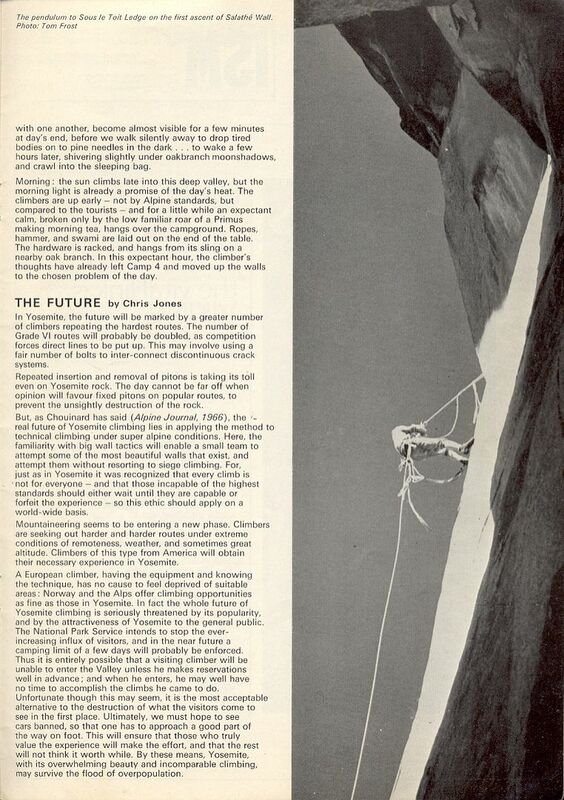 This issue of Mountain was the introduction of Yosemite climbing to a British and continental audience. All the luminaries, even Boodawg, weigh in! Beginning with the photo that accompanies the OP. Sweet thread! I love this stuff. Great memories. 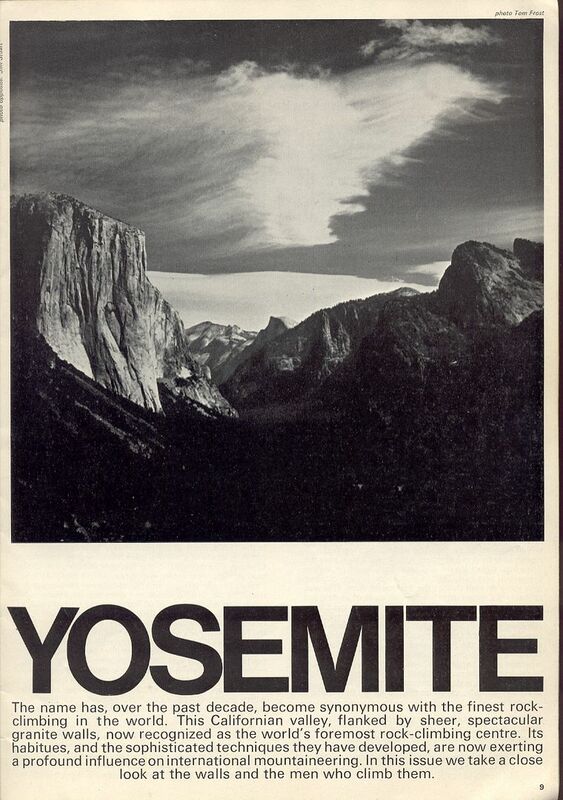 The real British Invasion (following the Beatles in 1964) into Yosemite began in 1966, when climbers like Don Whillans and Mike Kosterlitz came. Royal Robbins had been in Europe the year before, where he and Liz along with John and Marilyn Harlin taught at the Leysin American School. 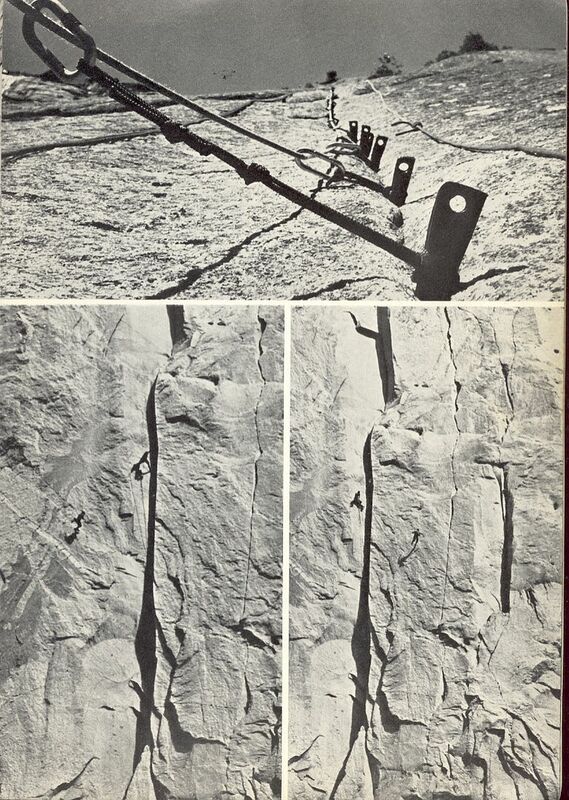 In 1966 Royal started using nuts on some of the Yosemite climbs, and in the following year he and Liz put up Nutcracker Suite on Manure Pile Buttress. There are some other stories on the thread Where Whillans Went. 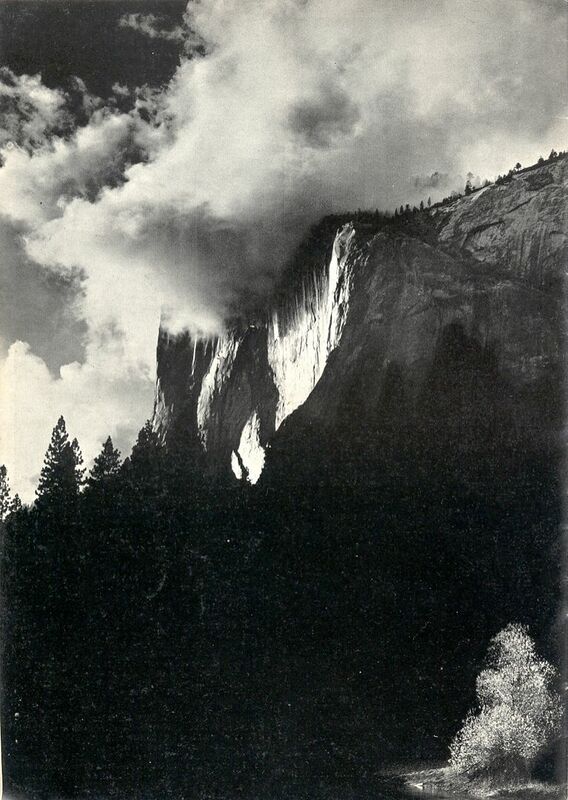 At the end of the summer of 1966, Whillans and Kosterlitz and two others did the Regular Route on Half Dome, perhaps the first British ascent of a Yosemite Grade VI.